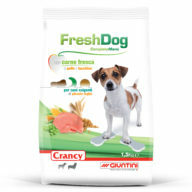 Cannot replace a complete food for your dog. Up to 10 to 40 treats, depending on the size and breed of your dog (up to 10 treats for small dogs; up to 40 treats for large dogs). Cereals, Meat and animal derivatives, Vegetable protein extracts, Oils and fats, Fish and fish derivatives, Sugars, Vegetables (spinach min. 2% and Tomato min. 0,8%), Minerals. Crude protein: 23%; Crude oils and fats: 15%; Crude fibres: 2,2%; Crude ash: 8,5%.